Orders placed by 2:00 PM EST will be processed the same day. However, this does not mean that orders placed by 2:00 PM will be shipped the same day. Some orders will ship the same day, and most orders will be shipped within 2 business days. Orders that will take longer to ship - including but not limited to items over 150 lbs which require freight shipping, custom built hoists or non-stock parts, rarely replaced parts of hoists and hoist components - will be specially marked online or you will receive notice of the delay. Please note that Hoosier Crane has a $50.00 Minimum Order Amount for online purchases. When your order is shipped, you will receive a notification and shipment tracking number from UPS or other carrier. You will receive the tracking number within 24 hours of the order being shipped on a normal basis. For some orders, a tracking number may not be immediately available, this is often the case with direct ship orders. We apologize in advance for this inconvenience. Fast Ship - This is a special designation of product that is physically ready to ship either directly from our Elkhart, IN warehouse or from a manfacturers warehouse. These items will be out the door within 24-36 hours of placing the order and in some cases sooner. In Stock - Hoists, hoist components and parts marked as "In Stock" are either kept in stock at our location or are usually in stock and available for quick shipment from the manufacturer's facility. These items usually ship within 5 business days. Backordered / Ships In 4 - 6 Weeks - Items marked as "Ships in 4-6 Weeks" are primarily custom or specially built hoists or hoist components. These items are not usually manufactured until the order is placed and are rarely kept in stock. These items usually ship within 4 - 6 weeks from the date of order. If you need a better estimate of shipping date please call and we will attempt to provide current availability. Items weighing over 150 lbs and items specified by the manufacturers’ recommendation require freight shipping in most cases. Our current preferred carrier is C. H. Robinson. They are able to provide us with aggressive pricing, but if you would like use your carrier of choice please call in to place your order at (800) 509-6131 between 7 am - 5 pm, Monday - Friday and we would be happy to arrange the order. Please specify if your location is not a business with a dock, this will avoid unexpected freight charges and make sure that a lift gate is available to get your product off loaded. We currently cannot give an accurate shipping quote on the online store, on items requiring freight shipping. 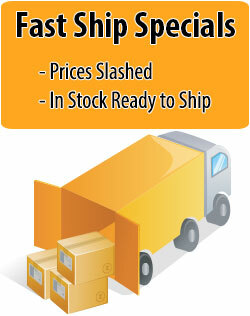 To place an order for an item requiring freight shipping, please call us at (800) 509-6131 . Items over 150 lbs will have a notice to order by phone. If you have special instructions for the delivery of your order, please note them in the area provided during checkout. You may also call us to place your order at (800) 509-6131. For all items weighing under 150 lbs, we ship via UPS. We offer a variety of shipping options, from standard Ground Shipping to 2-Day Early AM Shipping. During checkout, you will be able to select from these shipping options (cost of each shipping option will be listed on same page). For all items with freight specified shipping we ship via C. H. Robinson. If you would like us to ship your order with a different carrier, please call us at (800) 509-6131. U.S. customer service: 1-800-PICK-UPS (1-800-742-5877), or [email protected]. If you have any questions about anything not detailed on this page, please call us at (800) 509-6131 before placing an order. We are not responsible for orders that are shipping incorrectly due to incorrectly entered billing/shipping information. If you place an order and receive the incorrect item, please contact us as soon as possible so that we may ship the correct item to you quickly. If you place an order for the incorrect item, please contact us as soon as possible and we will assist you in getting the correct item as quickly as possible. Most orders will ship from our primary facility, located at 58144 Charlotte Avenue, Elkhart, IN 46517. Some orders may be shipped directly from the manufacturers' facilities. Hoosier Crane ships worldwide to all countries authorized to do trade with the United States. We unfortunately are not currently equipped to process international payments or shipping through our ecommerce website at this time. If you see a product you are interested in please contact us at 800-509-6131 or 574-523-2945 or via the contact us form. We will be happy to work you on preparing your crane and hoist orders for export. We do significant sale with Canadian customer and have a full line of CSA certified hoists and cranes available. In some instances we may require that you work with a freight forwarder for your export orders to certain countries. The buyer is responsible for all customs duties, currency conversion costs, or additional fees incurred in the export process, as these costs are not included in the advertised price. Hoosier Crane Service Company, Inc.